Have you heard the story about the baptism of the Gauls? The Gauls were a feared warlike people who in ancient times inhabited what is now France and Belgium. By the time of the Christian era they had been conquered by the Roman Empire and were supposedly under its control. The extent of this control varied and there were numerous Gallic uprisings. A number of Christian missionaries ventured into Gallic territory and many of the Gauls were baptized. Further, when a converted warrior was baptized in a river or stream, he would hold one arm high in the air as the missionary dunked him under the water. This seemed a peculiar custom and the missionaries soon learned the reason. When the next battle or skirmish broke out, the warlike Gaul could proclaim: “This arm is not baptized!” He would then grab his weapon and ride off to destroy his enemy. The reason I share this story is because I find it compelling: the picture of someone trying to keep one part of their body, one aspect of their identity, free from the influence of baptism. Another reason I have shared the story is because, like baptism, stewardship is about getting completely wet. It is about looking at ourselves, discovering what it is that we would like to keep dry, and then immersing whatever that is in the waters of Holy Baptism. Stewardship is about giving to God. It is about turning total control of our lives over to God. But when we hear the word stewardship, what is the first thing that we think of? Many people say, “Money,” and there may be two reasons for that. First, there is a lingering misconception among many Orthodox that stewardship is just a fancy word for “fund-raising.” But stewardship is not fund-raising. It is a way of life. Second, in today’s world, money is the one thing that many of us would most like to keep dry. Many of us want to go under the water with that outstretched arm clutching … not an ax or a war-hammer, but a purse or wallet. And that is why, when we talk about stewardship today, we often talk about money more than we do about anything else. For some years now we have been trying to get people to realize that stewardship is not just about money. 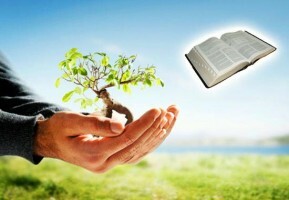 Someone came up with the phrase “time, talents, and treasures.” There is also the whole matter of “stewardship of the earth,” taking proper care of the planet that God has given us (Genesis 1:26; Psalm 8:6): conserving water, recycling paper and aluminum, preserving wetlands and rainforests. Or we might speak of “stewardship of our families” (Exodus 20:12; Proverbs 22:6; Mark 7:9-13; 1 Timothy 5:8): nurturing our marriages, raising happy and healthy children, caring for elderly parents. In truth, stewardship may involve lots of things. Properly speaking, stewardship is about all of life, about giving ourselves to God and using all that God has given us in grateful and appropriate ways. Yet we talk mostly about money because more than anything else we find money to be the greatest challenge. The Bible reports Jesus as saying, “You cannot serve God and mammon” (Matthew 6:24); mammon refers to money and the things that money can buy – material possessions. Jesus might have said this about “God and politics” or about “God and sports” or about God and any number of other things that might become obsessions. But he didn’t. He said, “God and mammon.”—money. The Bible also presents the apostle Paul as saying, “The love of money is the root of all kinds of evil” (1 Timothy 6:10). Paul might have said this about “the love of status” or “the love of power” or the love of any number of other things. But he didn’t. He said money. Money and material possessions are especially prominent candidates for idolatry and are chief contenders for unwarranted affection. A Christian writer said, that humans need to experience three conversions: (1) a conversion of heart, (2) a conversion of the mind, and (3) a conversion of the purse. Even baptized people like to keep their money dry. In fact, many of us try to rope off this one area of our life as “off-limits” to spiritual inspection. “It’s nobody’s business what I do with my money,” we say, not realizing just how foolish that sounds. It’s God’s business, isn’t it? But here is something that many people do not know: what the Bible teaches about stewardship is good news! When we come to understand and practice what the Bible says about stewardship, we will have happier, better lives.